The majority of kitchen fires begin on kitchen cooking appliances and flare up into the kitchen exhaust system. Regular maintenance of the exhaust system and equipment is one of the primary defenses against fire hazards. Trans-Clean's policy is quite simple. We provide quality work at reasonable prices. 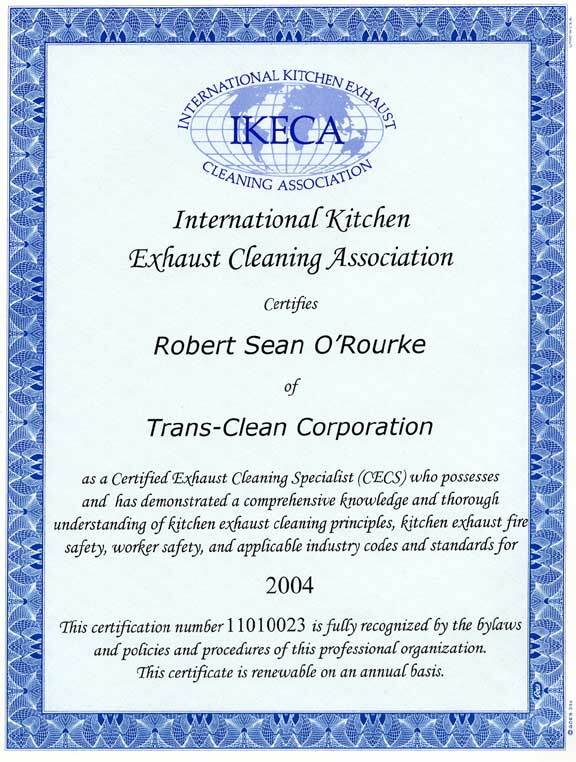 We've been cleaning commercial kitchen exhaust systems to the highest standards since 1981. We've developed our own methods for doing the job right, efficiently, economically, and with no mess. We clean it all. The inside and outside of hoods, entire filter systems from the ductwork to the fan on the roof -- including the inspection of fan belts and motors. In today's regulatory environment, for your protection and ours, we do the job by the book. Our containment methods capture washwater for proper, legal disposal. Our uniformed personnel and modern, well-marked vehicles mean that we will be a professional presence at your site. We are members of the National Fire Prevention Association and the International Kitchen Exhaust Cleaning Association. Are they Certified by the IKECA? We have invested a significant amount to train our kitchen exhaust specialists and to certify them annually.